I am continually drawn to older, simpler, lutherie technology. There are several reasons for this but mostly I am attracted to the older methods because they work well and I enjoy the experience of using them. With hand tools the craftsperson’s body and skill replace many jigs and machines. Working this way makes me feel like I truly accomplished something every step of the way. For several months I have been studying and improving the skills of using knives as they apply to being a dulcimer builder. With knives I can cut out tops and backs with cleaner edges than I can with a bandsaw. I can fit parts, trim and clean up hard-to-reach areas, shape braces, relieve edges, and more. I have long been aware of a style of knife developed and used by guitar makers in the Paracho area of Mexico. These “curchillos knives” have evolved specifically for guitar making. Curchillo knives are often made by the luthier and I have intended to make one for several years. I just never got around to doing it. Last week I was having coffee with my friend Paul. Paul is a musician, craftsperson, outdoorsman and all-around wonderful human being. He also makes barrels of sauerkraut every year to give away at Christmas. 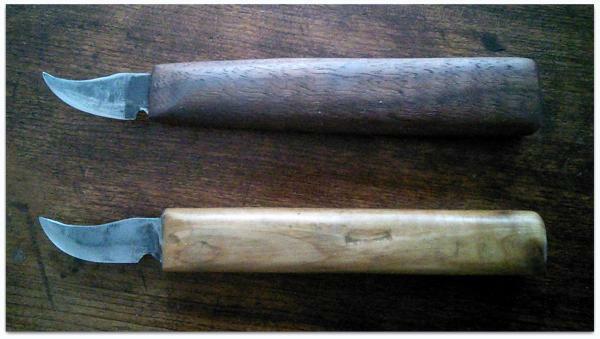 Yesterday Paul and I got together and he gave me these two curchillo knives he made for me from an old saw blade. I spent about 10 minutes with stones and a strop and both knives take and hold a very sharp edge. The shape of the blade is perfect for carving and cutting out many dulcimer parts. I am a very happy dulcimer builder! And I am thankful to have wonderful friends like Paul! In the future I’ll be posting some of the work I do using these knives! Realizing that the Self is actionless, I do whatever presents itself, and live happily.